Ina Margaret Canizaro Burg, 96, of Salida, died Wednesday August 29, 2018. 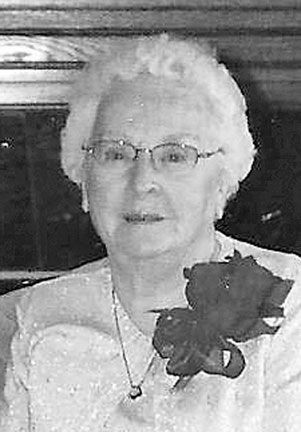 She was born December 1, 1921 in St. Paul, Minnesota to George A. and Elsie (Fraser) North. She moved to Chicago in 1934 and lived in Illinois for the next 63 years where she raised her family and worked as a medical transcriber. She moved to Salida in 1996. She enjoyed gardening, swimming and spending time with her family. She was a member of St. Joseph Catholic Church. She was preceded in death by her parents, husbands James Canizaro and Christopher William Burg, brother Thomas North and sons-in-law John Frecking and Dr. Edward Bryant. She is survived by her daughters Margaret “Peggy” (Bruce) Petersen of Salida, CO, Nina Bryant of Salida, CO, Ina Frecking of Gurnee, Illinois and Elizabeth (Randy) Amettis of Salida, CO, 7 grandchildren and 8 great grandchildren. A memorial mass will be held 10:30 AM Saturday October 13, 2018 at St. Joseph Catholic Church. Arrangements are with Lewis and Glenn Funeral Home. Memorial Contributions can be made to Ark Valley Humane Society, Farm to Table or St. Joseph Catholic Church Organ Fund through Lewis and Glenn Funeral Home. On line condolences may be offered at lewisandglenn.com.